Paris is so much more than the Eiffel Tower and the Louvre. Once you go beyond the obvious, the City of Lights has unknown landmarks hidden away in its landscape. And since Paris is a place best explored by foot, many of these off-the-beaten-track locales can be spotted in its central neighborhoods. To be sure, all of these unknown or overlooked sites are important parts of Parisian history. But it's more than just history; these must-see landmarks are also surprise discoveries which are worth seeking out. To escape the tourist crowds, here are 12 of the lesser-known spots that need to be tacked on your itinerary during your next trip to the French capital. A building at 51 rue de Montmorency in the 3rd arrondissement is crowned as the oldest stone house in Paris. As the plaque outside reads (in French), it was “The House of Nicolas Flamel.” Built in 1407 by Flamel, the most famous alchemist in Paris, this is where he was rumored to have carried out his experiments. It was restored in 1900 but still has prayers for the dead engraved on the pillars of the building’s façade. Today, it's a fine dining restaurant called the Auberge Nicolas Flamel. It measures 3.3 feet wide and just 16.4 feet tall. As the smallest building in Paris, 39 Rue du Chateau d'Eau started out as an inconvenient narrow gap between two buildings in the 10th arrondissement, which was then built upon to solve a property dispute. After its construction, the structure was first a shoemaker's studio with a live-in studio upstairs but now is an apartment. Finding this nightclub set in the heart of the Buttes Chaumont—a picturesque park in the city's 19th arrondissement—in the dark is all part of the fun. Find it, though, by its pink neon sign. Rosa Bonheur is named after the famous French realist painter from the 19th century, who was a well-known lesbian. A fun-loving nightclub with electro DJs and a dance floor, this is where to let loose until the sun comes up. The club also has brunch on weekends, bon appetite! At the top of a small hill just west of the Buttes Chaumont park, there is a neighborhood micropark tucked in the corner of the 19th arrondissement. This small area, crowned by the Le Butte-Bergeyre Jardin (named after the 19th-century rugby player Robert Bergeyre) is one of the last remaining vineyards in Paris. It can be reached only by three public staircases and is hidden in the park. Along the way, don't miss the stunning view of Paris from the top of the hill. Deep down Rue Vercingétorix and beyond a set of large iron gates, the Jardin des Colonnes is a lavender garden off the beaten path in the 14th arrondissement. Built in 1986, it’s located inside a public space in a circular architectural building designed by Catalan architect Ricardo Bofill. This overlooked city garden is a rare gem of futuristic architecture, which is a rarity in Paris. The circular building is filled with glass mirror panes. 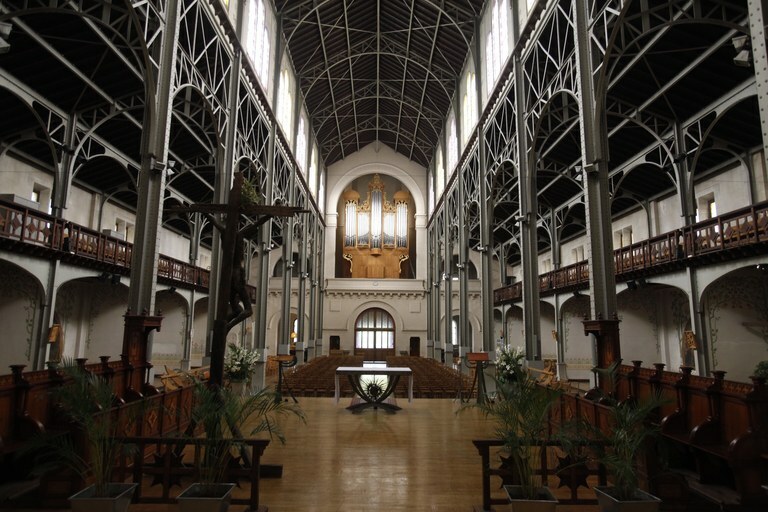 A masterpiece created by metal, the Notre dame du Travail is much unlike the rest in Paris. Designed by the French-born architect Victor Baltard, it’s built with exposed iron rods inside. Located on the south side of the Place de Catalogne, the structure was initially built as a parish church for railway workers who created the Gare Montparnasse in the 19th century, but today it's a rare beacon of architecture. With its neo-Romaneque façade and dual octagonal towers, it's filled with mosaics, metal beams, and Art Nouveau influences, giving it an eclectic and unfinished look. All of Parisian cemeteries are special because they're so old, but one is set apart from the rest. Le Cimetière des Chiens is a pet cemetery devoted to all kinds of animals. Set in a small suburb in the northwest section of the city, it's been open since 1899. Beyond the large set of iron gates, there are graves devoted to cats, dogs, horses, monkeys, and sheep. One grave is for Barry, a dog who fought in the First World War and saved the lives of 40 people. The cemetery also has dozens of cats wandering around, who live on the grounds. The charming Magic Museum is hidden underground in a cellar-like abode, making this space feel a lot like entering a cave lair of a master trickster. An exhibition space tucked in the Marais, this small museum is filled with history on the world of illusionists from the 18th century onward; from France’s great illusionists to Houdini, historical cabinets and warped mirrors. It also traces how magic has made its way into the oeuvre of Victor Hugo. With real magicians on board, every visit ends with a magic show set in a vintage theater. Set inside an 19th-century mansion, the Musée Jacquemart-André is the former home of Edouard André, an art collector who traveled the seven seas with his wife, Nélie Jacquemart, a renowned portrait artist, to buy and collect art and furniture, much of which are still here today. There is period furniture, tapestries, and Renaissance art from Venice, as well as ceiling murals and porcelain. Sort of like a mini Versailles, the best part about visiting here is that it can be seen without the crowds. There are two perfume museums in Paris: One is the Fragonard Musée du Parfum, but the other is a lesser-known one called Le Grand Musée du Parfum. Tucked away in a ivy-filled courtyard, Le Grand Musée traces the history of perfume, from ancient Egypt to Coco Chanel’s No. 5. Set inside a stately 19th-century mansion, it’s a walk through a garden of mystery smells, a mock-up perfuming studio, and the raw materials that make scents. Spot this tiny bookstore by its Canadian flag dangling above its doorway on the small alley-like street of Rue de la Parcheminerie. Founded by Canadian bookseller Brian Spence, the Abbey Bookstore has been a staple for English-language readers since 1989. Set in the heart of the Latin Quarter, it’s a tiny delight with over 35,000 books stacked to its ceilings, and has wooden ladders that can fetch any title. With tomes that date back to the Middle Ages, it specializes in rare fiction, photography books, and out-of-print titles you won't find on Amazon. Wander downstairs to the basement to find psychology and a spiritual section, but the real deals are the paperbacks on the front patio, which you can browse through with a complimentary cup of coffee. C'est bon!